Machine learning models are often tuned by nesting optimization of model weights inside the optimization of hyperparameters. 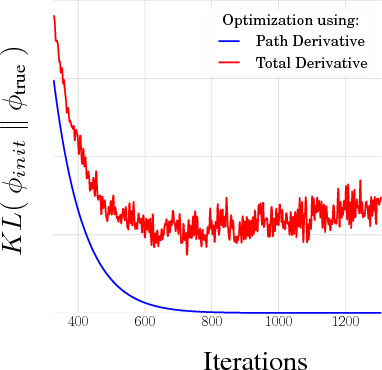 We give a method to collapse this nested optimization into joint stochastic optimization of weights and hyperparameters. Our process trains a neural network to output approximately optimal weights as a function of hyperparameters. We show that our technique converges to locally optimal weights and hyperparameters for sufficiently large hypernetworks. 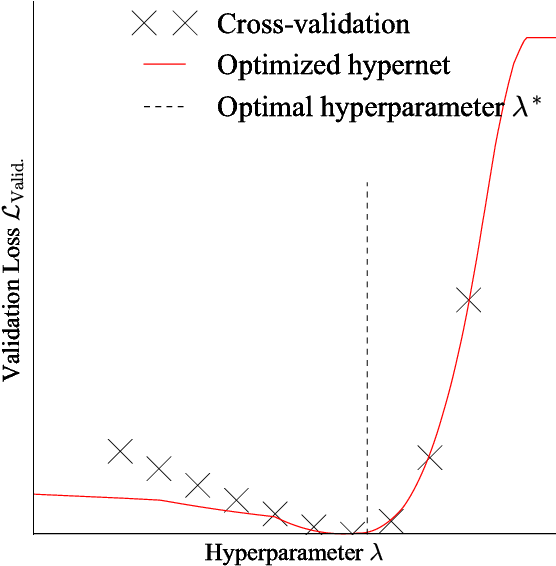 We compare this method to standard hyperparameter optimization strategies and demonstrate its effectiveness for tuning thousands of hyperparameters. 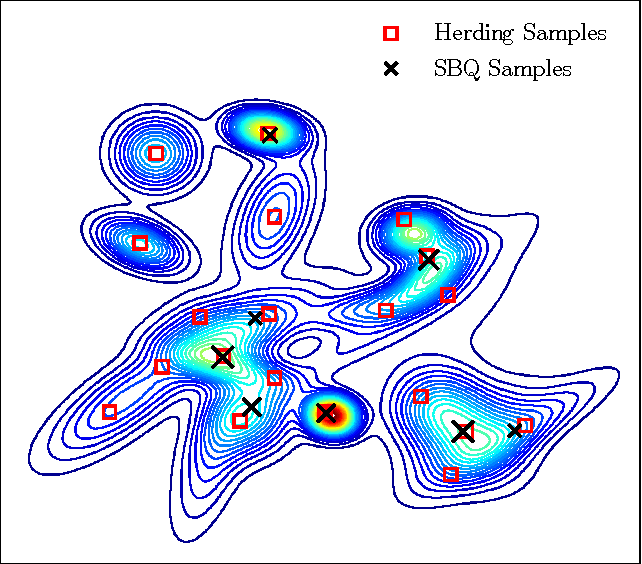 Herding and kernel herding are deterministic methods of choosing samples which summarise a probability distribution. A related task is choosing samples for estimating integrals using Bayesian quadrature. We show that the criterion minimised when selecting samples in kernel herding is equivalent to the posterior variance in Bayesian quadrature. We then show that sequential Bayesian quadrature can be viewed as a weighted version of kernel herding which achieves performance superior to any other weighted herding method. We demonstrate empirically a rate of convergence faster than O(1/N). Our results also imply an upper bound on the empirical error of the Bayesian quadrature estimate. A surprising property of word vectors is that vector algebra can often be used to solve word analogies. However, it is unclear why - and when - linear operators correspond to non-linear embedding models such as skip-gram with negative sampling (SGNS). We provide a rigorous explanation of this phenomenon without making the strong assumptions that past work has made about the vector space and word distribution. Our theory has several implications. Past work has often conjectured that linear structures exist in vector spaces because relations can be represented as ratios; we prove that this holds for SGNS. 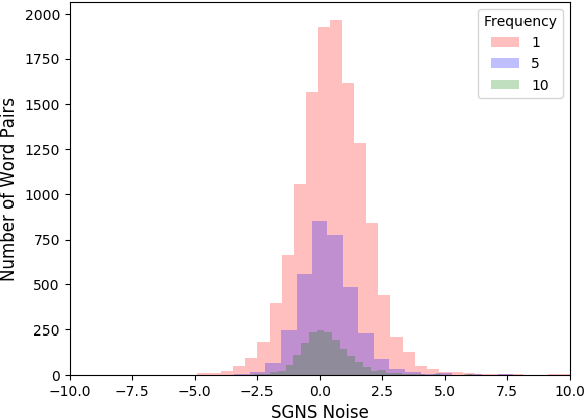 We provide novel theoretical justification for the addition of SGNS word vectors by showing that it automatically down-weights the more frequent word, as weighting schemes do ad hoc. 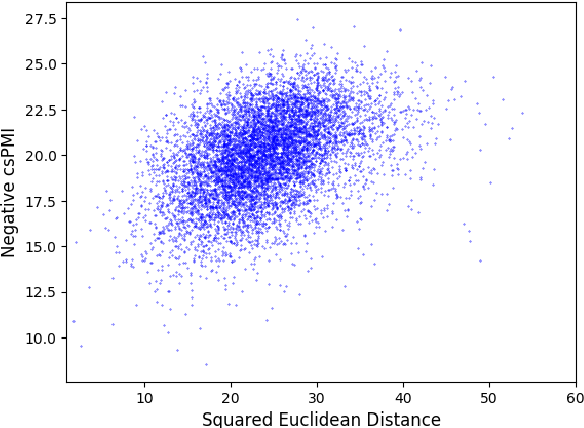 Lastly, we offer an information theoretic interpretation of Euclidean distance in vector spaces, providing rigorous justification for its use in capturing word dissimilarity. Amortized inference allows latent-variable models trained via variational learning to scale to large datasets. 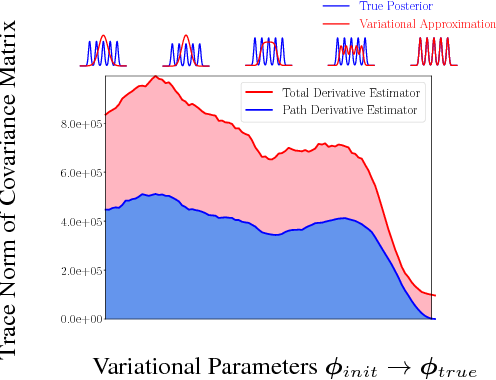 The quality of approximate inference is determined by two factors: a) the capacity of the variational distribution to match the true posterior and b) the ability of the recognition network to produce good variational parameters for each datapoint. 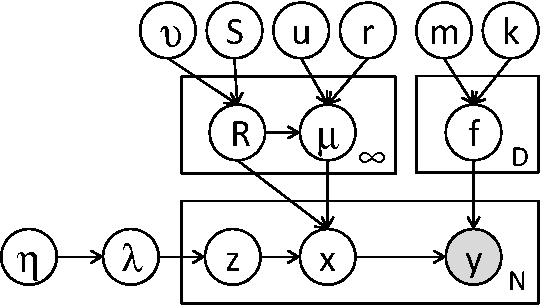 We examine approximate inference in variational autoencoders in terms of these factors. We find that divergence from the true posterior is often due to imperfect recognition networks, rather than the limited complexity of the approximating distribution. We show that this is due partly to the generator learning to accommodate the choice of approximation. Furthermore, we show that the parameters used to increase the expressiveness of the approximation play a role in generalizing inference rather than simply improving the complexity of the approximation. The standard interpretation of importance-weighted autoencoders is that they maximize a tighter lower bound on the marginal likelihood than the standard evidence lower bound. We give an alternate interpretation of this procedure: that it optimizes the standard variational lower bound, but using a more complex distribution. We formally derive this result, present a tighter lower bound, and visualize the implicit importance-weighted distribution. We propose a simple and general variant of the standard reparameterized gradient estimator for the variational evidence lower bound. Specifically, we remove a part of the total derivative with respect to the variational parameters that corresponds to the score function. Removing this term produces an unbiased gradient estimator whose variance approaches zero as the approximate posterior approaches the exact posterior. 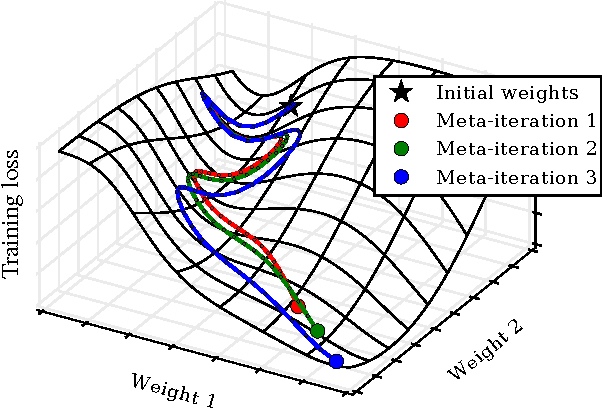 We analyze the behavior of this gradient estimator theoretically and empirically, and generalize it to more complex variational distributions such as mixtures and importance-weighted posteriors. Markov Chain Monte Carlo (MCMC) algorithms are a workhorse of probabilistic modeling and inference, but are difficult to debug, and are prone to silent failure if implemented naively. 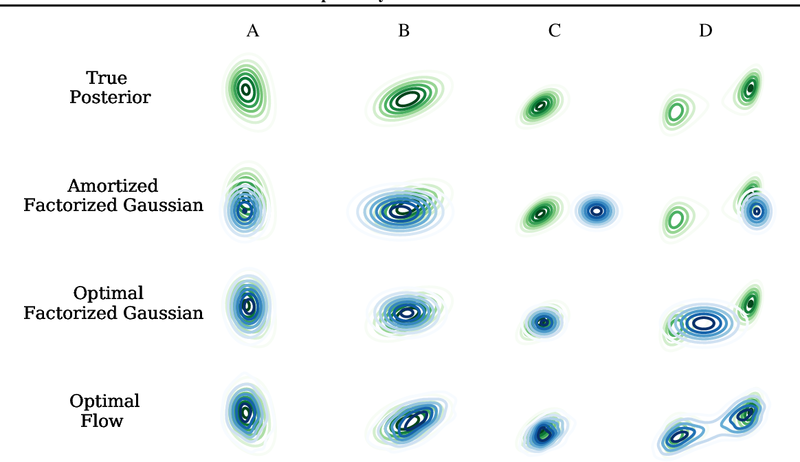 We outline several strategies for testing the correctness of MCMC algorithms. Specifically, we advocate writing code in a modular way, where conditional probability calculations are kept separate from the logic of the sampler. We discuss strategies for both unit testing and integration testing. As a running example, we show how a Python implementation of Gibbs sampling for a mixture of Gaussians model can be tested. Runge-Kutta methods are the classic family of solvers for ordinary differential equations (ODEs), and the basis for the state of the art. Like most numerical methods, they return point estimates. We construct a family of probabilistic numerical methods that instead return a Gauss-Markov process defining a probability distribution over the ODE solution. In contrast to prior work, we construct this family such that posterior means match the outputs of the Runge-Kutta family exactly, thus inheriting their proven good properties. Remaining degrees of freedom not identified by the match to Runge-Kutta are chosen such that the posterior probability measure fits the observed structure of the ODE. 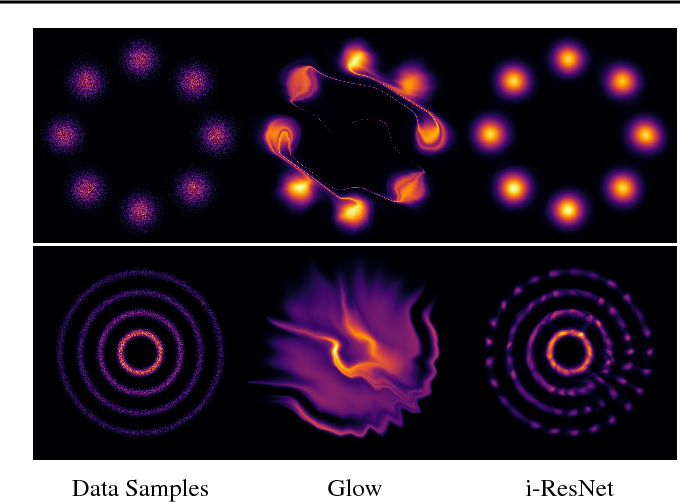 Our results shed light on the structure of Runge-Kutta solvers from a new direction, provide a richer, probabilistic output, have low computational cost, and raise new research questions. 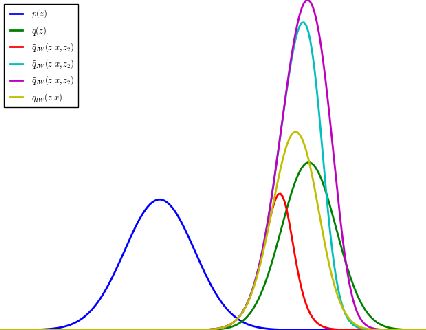 A mixture of Gaussians fit to a single curved or heavy-tailed cluster will report that the data contains many clusters. To produce more appropriate clusterings, we introduce a model which warps a latent mixture of Gaussians to produce nonparametric cluster shapes. The possibly low-dimensional latent mixture model allows us to summarize the properties of the high-dimensional clusters (or density manifolds) describing the data. The number of manifolds, as well as the shape and dimension of each manifold is automatically inferred. We derive a simple inference scheme for this model which analytically integrates out both the mixture parameters and the warping function. 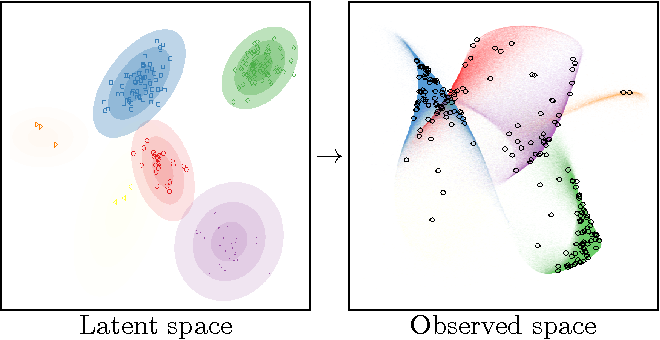 We show that our model is effective for density estimation, performs better than infinite Gaussian mixture models at recovering the true number of clusters, and produces interpretable summaries of high-dimensional datasets. Reversible deep networks provide useful theoretical guarantees and have proven to be a powerful class of functions in many applications. Usually, they rely on analytical inverses using dimension splitting, fundamentally constraining their structure compared to common architectures. 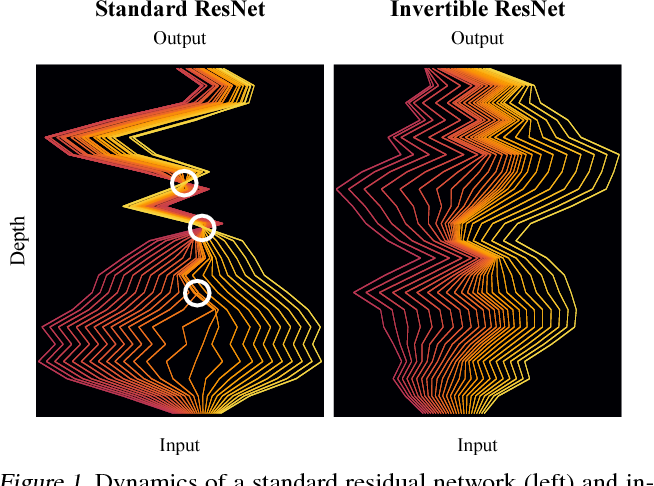 Based on recent links between ordinary differential equations and deep networks, we provide a sufficient condition when standard ResNets are invertible. 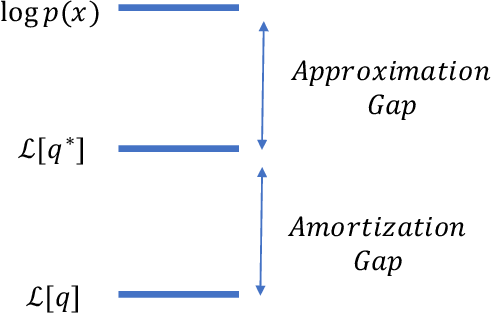 This condition allows unconstrained architectures for residual blocks, while only requiring an adaption to their regularization scheme. We numerically compute their inverse, which has O(1) memory cost and computational cost of 5-20 forward passes. 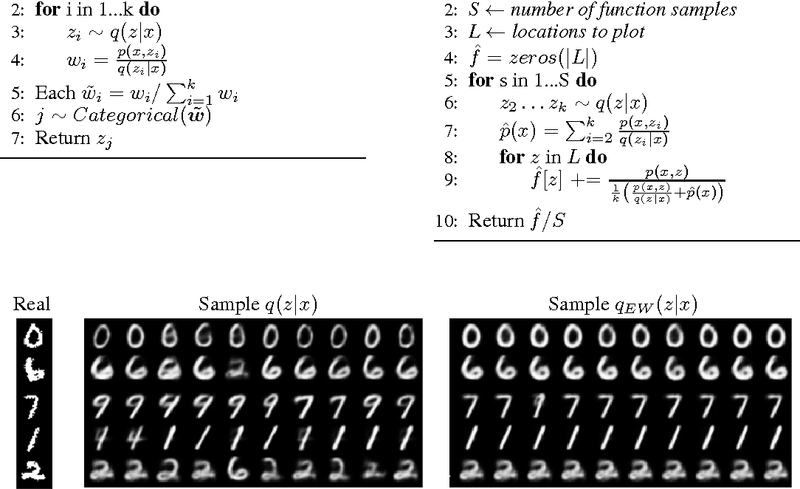 Finally, we show that invertible ResNets perform on par with standard ResNets on classifying MNIST and CIFAR10 images. 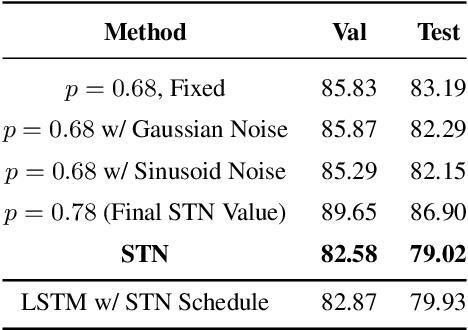 We show that unconverged stochastic gradient descent can be interpreted as a procedure that samples from a nonparametric variational approximate posterior distribution. This distribution is implicitly defined as the transformation of an initial distribution by a sequence of optimization updates. By tracking the change in entropy over this sequence of transformations during optimization, we form a scalable, unbiased estimate of the variational lower bound on the log marginal likelihood. We can use this bound to optimize hyperparameters instead of using cross-validation. This Bayesian interpretation of SGD suggests improved, overfitting-resistant optimization procedures, and gives a theoretical foundation for popular tricks such as early stopping and ensembling. We investigate the properties of this marginal likelihood estimator on neural network models. 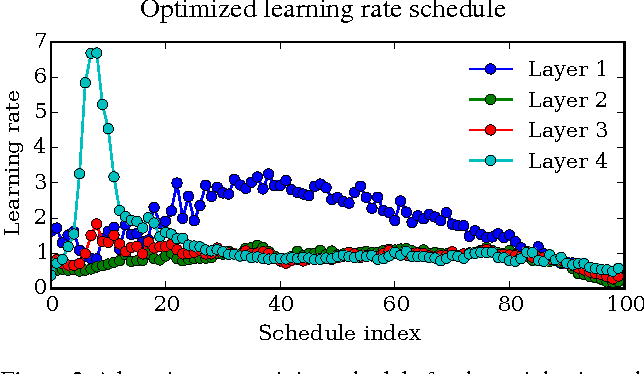 Tuning hyperparameters of learning algorithms is hard because gradients are usually unavailable. 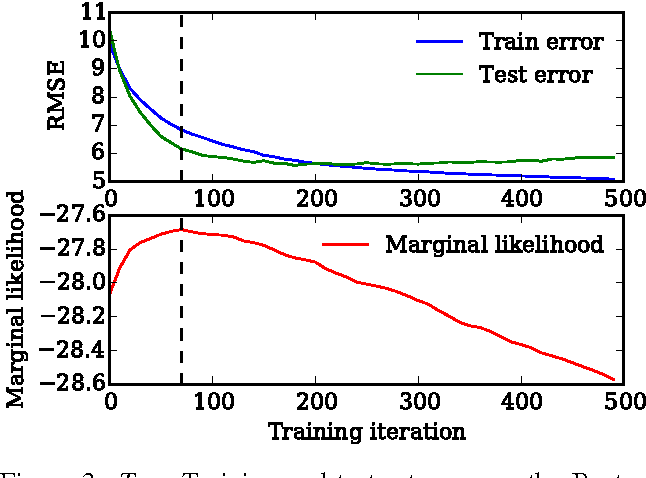 We compute exact gradients of cross-validation performance with respect to all hyperparameters by chaining derivatives backwards through the entire training procedure. 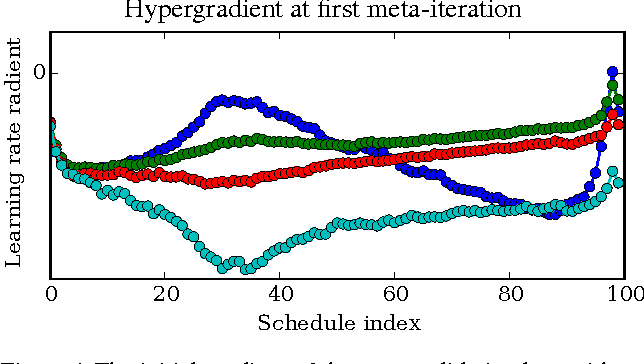 These gradients allow us to optimize thousands of hyperparameters, including step-size and momentum schedules, weight initialization distributions, richly parameterized regularization schemes, and neural network architectures. We compute hyperparameter gradients by exactly reversing the dynamics of stochastic gradient descent with momentum. We introduce a Gaussian process model of functions which are additive. An additive function is one which decomposes into a sum of low-dimensional functions, each depending on only a subset of the input variables. Additive GPs generalize both Generalized Additive Models, and the standard GP models which use squared-exponential kernels. 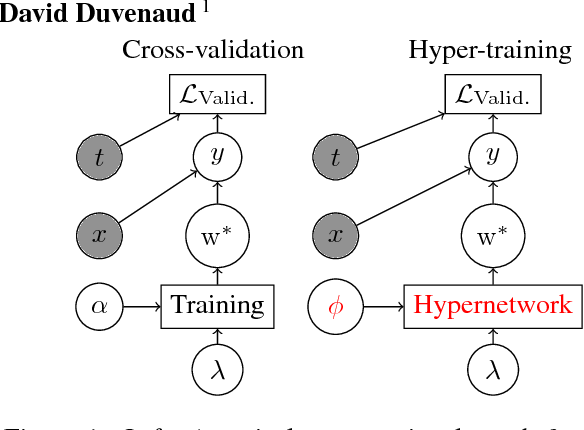 Hyperparameter learning in this model can be seen as Bayesian Hierarchical Kernel Learning (HKL). We introduce an expressive but tractable parameterization of the kernel function, which allows efficient evaluation of all input interaction terms, whose number is exponential in the input dimension. The additional structure discoverable by this model results in increased interpretability, as well as state-of-the-art predictive power in regression tasks. Variational Bayesian neural nets combine the flexibility of deep learning with Bayesian uncertainty estimation. Unfortunately, there is a tradeoff between cheap but simple variational families (e.g.~fully factorized) or expensive and complicated inference procedures. 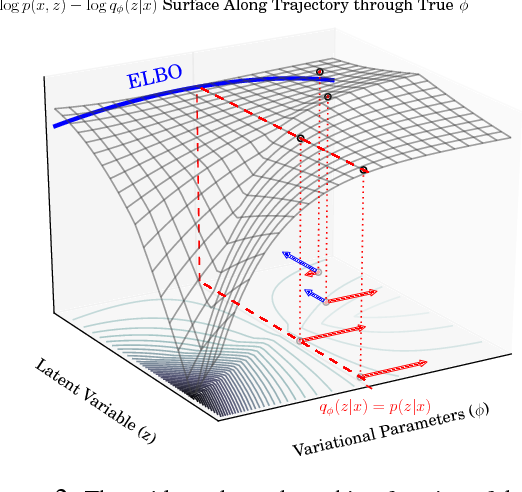 We show that natural gradient ascent with adaptive weight noise implicitly fits a variational posterior to maximize the evidence lower bound (ELBO). This insight allows us to train full-covariance, fully factorized, or matrix-variate Gaussian variational posteriors using noisy versions of natural gradient, Adam, and K-FAC, respectively, making it possible to scale up to modern-size ConvNets. 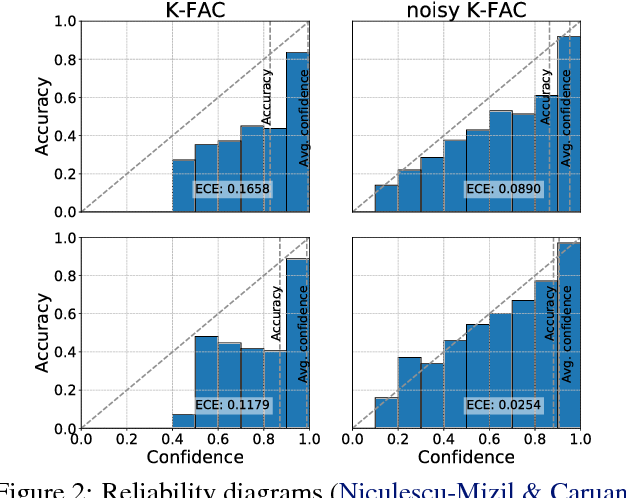 On standard regression benchmarks, our noisy K-FAC algorithm makes better predictions and matches Hamiltonian Monte Carlo's predictive variances better than existing methods. 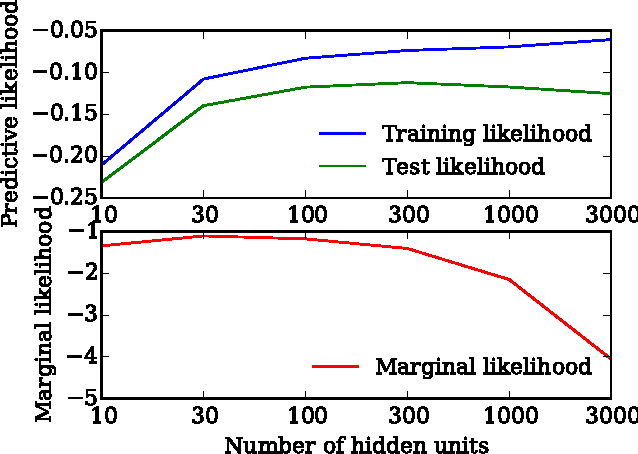 Its improved uncertainty estimates lead to more efficient exploration in active learning, and intrinsic motivation for reinforcement learning. 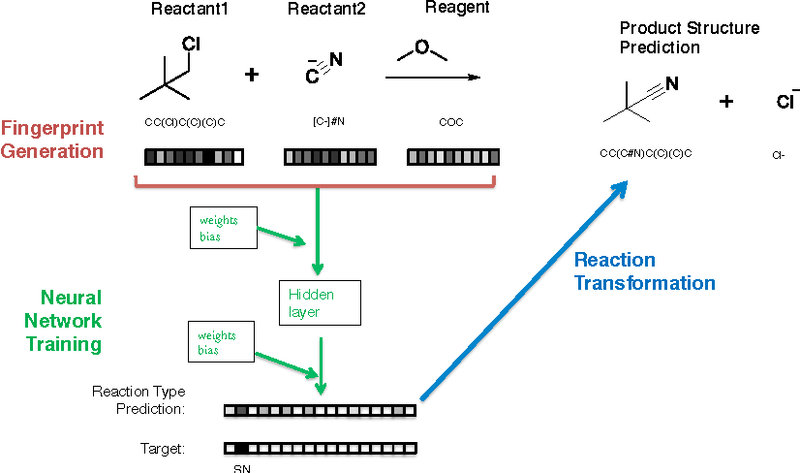 Reaction prediction remains one of the major challenges for organic chemistry, and is a pre-requisite for efficient synthetic planning. 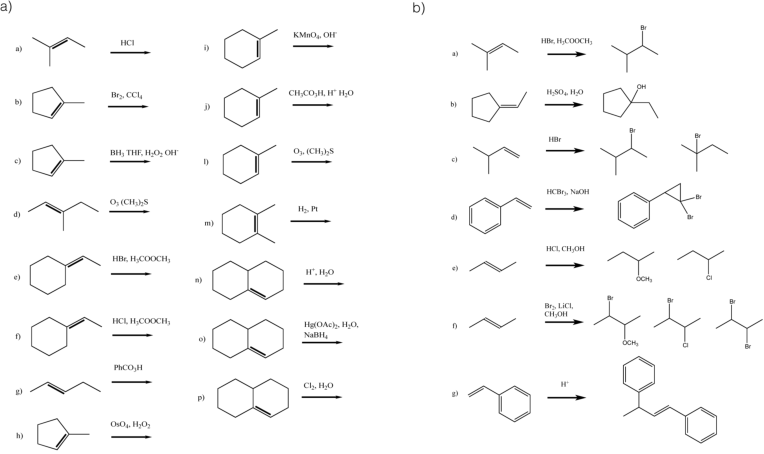 It is desirable to develop algorithms that, like humans, "learn" from being exposed to examples of the application of the rules of organic chemistry. We explore the use of neural networks for predicting reaction types, using a new reaction fingerprinting method. 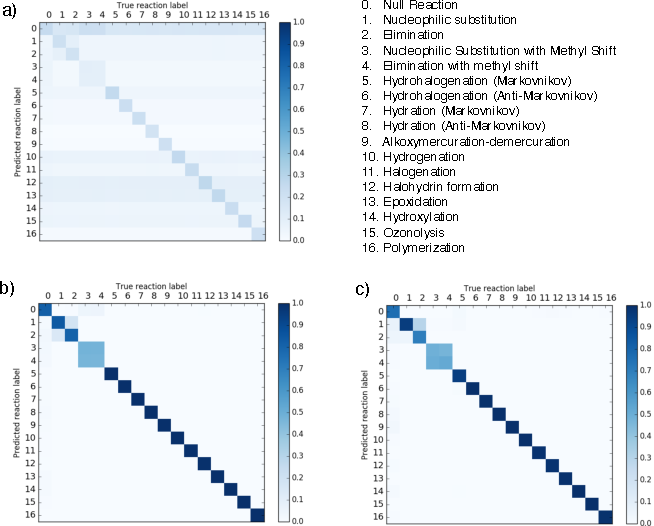 We combine this predictor with SMARTS transformations to build a system which, given a set of reagents and re- actants, predicts the likely products. We test this method on problems from a popular organic chemistry textbook. When a black-box classifier processes an input to render a prediction, which input features are relevant and why? We propose to answer this question by efficiently marginalizing over the universe of plausible alternative values for a subset of features by conditioning a generative model of the input distribution on the remaining features. In contrast with recent approaches that compute alternative feature values ad-hoc --- generating counterfactual inputs far from the natural data distribution --- our model-agnostic method produces realistic explanations, generating plausible inputs that either preserve or alter the classification confidence. When applied to image classification, our method produces more compact and relevant per-feature saliency assignment, with fewer artifacts compared to previous methods. Choosing appropriate architectures and regularization strategies for deep networks is crucial to good predictive performance. To shed light on this problem, we analyze the analogous problem of constructing useful priors on compositions of functions. Specifically, we study the deep Gaussian process, a type of infinitely-wide, deep neural network. 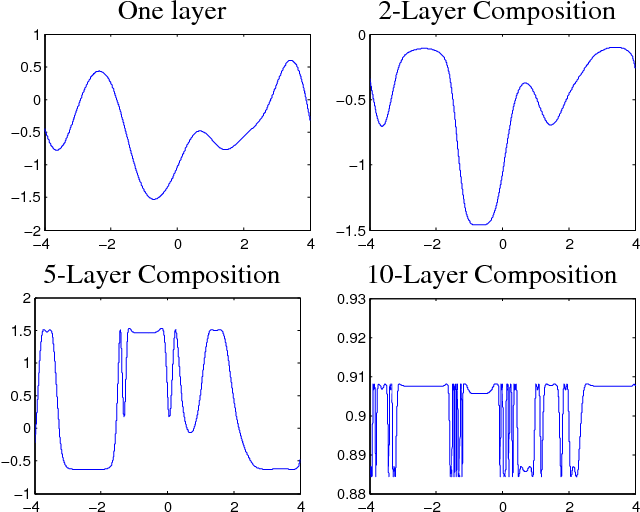 We show that in standard architectures, the representational capacity of the network tends to capture fewer degrees of freedom as the number of layers increases, retaining only a single degree of freedom in the limit. We propose an alternate network architecture which does not suffer from this pathology. We also examine deep covariance functions, obtained by composing infinitely many feature transforms. Lastly, we characterize the class of models obtained by performing dropout on Gaussian processes. 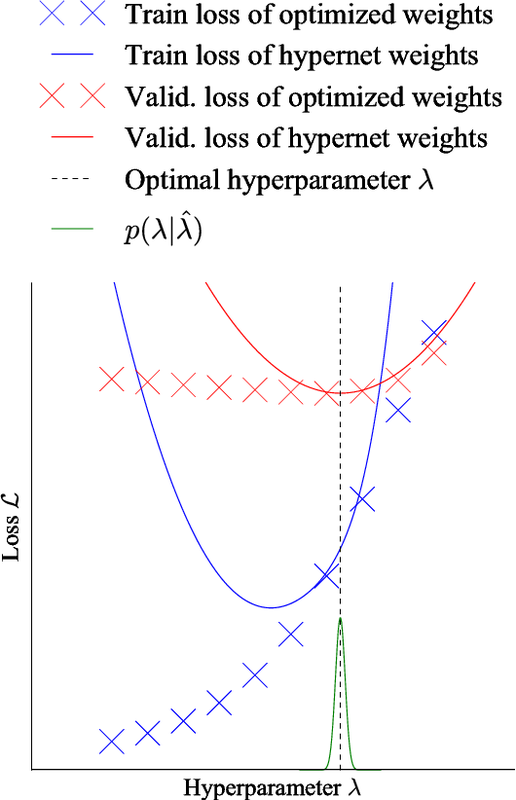 Hyperparameter optimization can be formulated as a bilevel optimization problem, where the optimal parameters on the training set depend on the hyperparameters. We aim to adapt regularization hyperparameters for neural networks by fitting compact approximations to the best-response function, which maps hyperparameters to optimal weights and biases. We show how to construct scalable best-response approximations for neural networks by modeling the best-response as a single network whose hidden units are gated conditionally on the regularizer. We justify this approximation by showing the exact best-response for a shallow linear network with L2-regularized Jacobian can be represented by a similar gating mechanism. We fit this model using a gradient-based hyperparameter optimization algorithm which alternates between approximating the best-response around the current hyperparameters and optimizing the hyperparameters using the approximate best-response function. Unlike other gradient-based approaches, we do not require differentiating the training loss with respect to the hyperparameters, allowing us to tune discrete hyperparameters, data augmentation hyperparameters, and dropout probabilities. Because the hyperparameters are adapted online, our approach discovers hyperparameter schedules that can outperform fixed hyperparameter values. 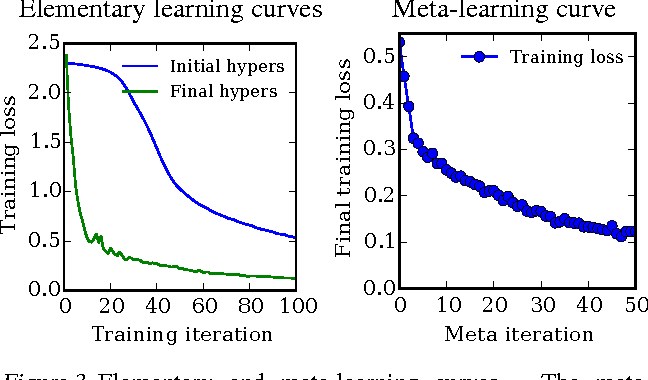 Empirically, our approach outperforms competing hyperparameter optimization methods on large-scale deep learning problems. We call our networks, which update their own hyperparameters online during training, Self-Tuning Networks (STNs).